Back in April I wrote my personal mission statement for The Ex-Christian Scientist. My work there, and having a life beyond my Ex-CS activities, are part of the reason I’m on hiatus for the summer. I thought I would share it with you here, and encourage you to visit The Ex-Christian Scientist if you have not already done so. I hope you’re having a relaxing summer. I started my journey away from Christian Science a little over six years ago. 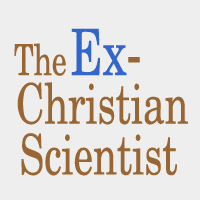 I had been struggling to make it work, and a series of pivotal, life-changing events finally forced me to acknowledge that Christian Science was not right for me. Leaving Christian Science was one of the most difficult things I’ve done, and I don’t want anyone to feel they have to do it alone. I have been fortunate to have the support of my husband, and a group of close fellow-former-Christian Science friends, as I’ve made my journey way. 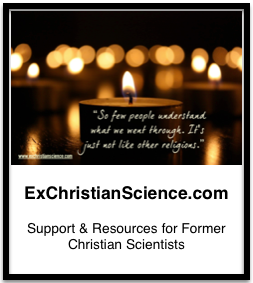 I’m launching the sort of support website for former Christian Scientists that I wanted when I started on my journey away from Christian Science. I don’t want to focus on the gut-wrenching horror stories many of us have in our pasts, I want to focus on helping people get the appropriate care and support they need. I am not going to tell you which spiritual path you should take, I’m going to encourage you to find your own. I don’t want to save your soul, I want you to take care of your body so you can have a long and healthy life. I don’t want you to feel alone, or crazy, as you leave Christian Science, I want you to realize there are others out there who have left as well, and it is okay to question, doubt, and leave. I want to help direct you to resources you may find useful on your journey, support communities, articles on healthcare, books. Good Christian Scientists don’t need lamps, they simply pray for everlasting light. 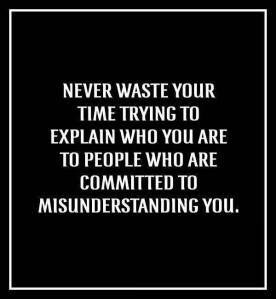 Awesome article that can be applied to many situations! I understand dental work can be a difficult issue for some people, which is why the majority of this post is behind the page break. I recently met with an oral surgeon to discuss taking out my remaining wisdom tooth, part of the consult involved a questionnaire about my medical history which has only gotten more complex and interesting the longer I am out of Christian Science. I was quite upfront about my anxiety surrounding dental procedures and mentioned that very early on I had several cavities filled without the benefit of local anesthetic. The oral surgeon looked at my x-rays in horror, nearly all of my teeth have had some sort of work done to them, including three root canals, some rather deep fillings, and two previous wisdom tooth extractions. I found myself facing that moment you find your self reassuring the oral surgeon that don’t worry, you “haven’t gone without local anesthetic since the late 1980s/early 1990s” and that “it was only two, maybe three that were filled without it and they were baby teeth” — this does NOT make it any better, but it does put in perspective how long it has been since I attempted to “pray away” the cavities. The oral surgeon recommended rescheduling w/general anesthetic instead of just local.